Rossiter System is an entirely new way of preventing and relieving pain in your body through hard, powerful, conscious TWO-PERSON stretching. It restores lost mobility - increasing range of motion caused by injury, overuse and recovery from surgery to restore easy movement. Rossiter Stretching helps in all phases of pain relief: Recovery, Maintenance, and Prevention. How do we provide this help? Rossiter System relief is quick, but it demands hard work from two people - a Rossiter trained Coach and YOU, PIC, which stands for Person in Charge. If you are in pain, you are in charge of your body. You are the person who will determine how quickly your pain will ease, depending on the amount of hard work you are willing to do. In Rossiter Workouts, you are an active participant in your recovery. It takes effort to stretch tight connective tissue. How exactly these techniques work? Unlike muscle stretches, The Rossiter techniques target the body's connective tissue, a head-to-toe network of fascia, ligaments, and tendons that holds everything together. In a healthy body, it's not too loose, and not too tight, and it is the body's system of "space". When connective tissue becomes overworked, stressed, or tired, it shortens and it tightens. 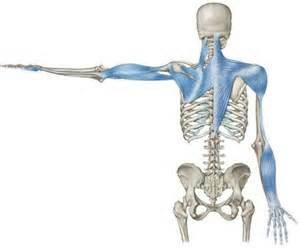 This lack of space is evident in pain, stiffness and an inability of the body to move easily. The resulting symptoms include tingling, tightness, numbness, knots, pain, soreness, tenderness, buzzing sensations and the like. These techniques were created specifically to loosen and lengthen the body's entire network of connective tissue so that it's loose, fluid, flexible and normal again - allowing you mov e freely, and without pain. What's so special about connective tissue? Connective tissue has two proteins - collage and elastin. When exposed to weight and heat (both from a Coach's foot), connective tissue begins to loosen so that you can shape and mold it again by stretching it back to normal. These proteins keep the tissue loose and stretchy. That also depends on how long you’ve had your pain, but each time you do Rossiter Workouts, you’ll relieve a little more pain than before and results will last longer, especially if you do Rossiter Workouts regularly, following all directions and instructions. Remember, there is no “permanent fix’ for pain, because our bodies continue to do the same activities, motions, movements and work every day. The good news is that if pain returns, you now have new tools to relieve it quickly and effectively, without drugs, splints, shots, or surgery. Rossiter sessions are SHORT on purpose. This is not traditional massage. It’s more powerful and more focused than most other modalities, and we guarantee you’ll get results or you don’t pay us. Rossiter stretching is always very effective for both recent and old injuries. If you’ve been under a doctor’s care, you need to be approved to resume ‘normal exercise’ before you can do Rossiter – especially if surgery was involved. you’ve ever felt. Each one can take anywhere from 10-30 seconds to complete. They are powerful and can be intense. If you like deep work, you’ll love Rossiter stretching workouts! one session for initial relief and two more to your retrain your body and keep the tightness and resulting pain gone longer. When you are where you want to be, schedule occasional follow-on sessions when tightness start trying to return ahead of it! Chronic, longer lasting issues may require more frequent workouts to get your body back to where you want it. Occasional workouts will help maintain that improvement. You must be able to get up and down off the floor by yourself. Rossiter stretches are done either on a mat or a low platform. If you are taking any painkillers - whether over the counter or prescription - you need to have them out of your system enough to judge the amount of weight and effort used for stretches accurately. If you have taken pain medications within 12-24 hours before a Rossiter session, you run the risk of over-working the area. Your body won't tell you how it is really feeling when those meds are busy fooling your brain. Are they Medically Right for You? As with massage, work should never be done on an area with open wounds, rashes, sores, contagious diseases or cancers. Rossiter might not be a good choice for you if you are taking - or have taken - Osteoporosis drugs such as Fosamax, Boniva, Actonel or Reclast (injection); Levaquin (a broad spectrum antibiotic), or blood thinners including: Coumadin, Heparin, Dicumarol, Miradon, Aspirin, Sintrom or Warfilone. Plavix is possibly contraindicated, as well. If you have been diagnosed with severe osteoporosis, Rossiter is not for you. Have you had a cortisone injection in the area you want to focus a Rossiter Session on? If you need help with Low Back Pain and have had cortisone shots OR surgery on your low back, we need to approach your pain differently. Expect to work twice as hard for 1/2 to 3/4 the results that someone who hasn't had shots or surgery would be able to achieve because your connective tissue system has been severely compromised. You want to allow up to 6 months for scar tissue formation after surgery before trying Rossiter System® Workouts. Make sure your doctor has released you for all activity! If you have cancer, it's generally recommended you be in remission before starting Rossiter System® Workout Sessions. Let's talk. If you've ever had Guillain-Barré Syndrome, you'll need to check with your doctor before undergoing a Rossiter Workout. If you have any doubts, please check with your doctor before trying a full workout. We are happy to talk with you about any questions or concerns you may have at any time.